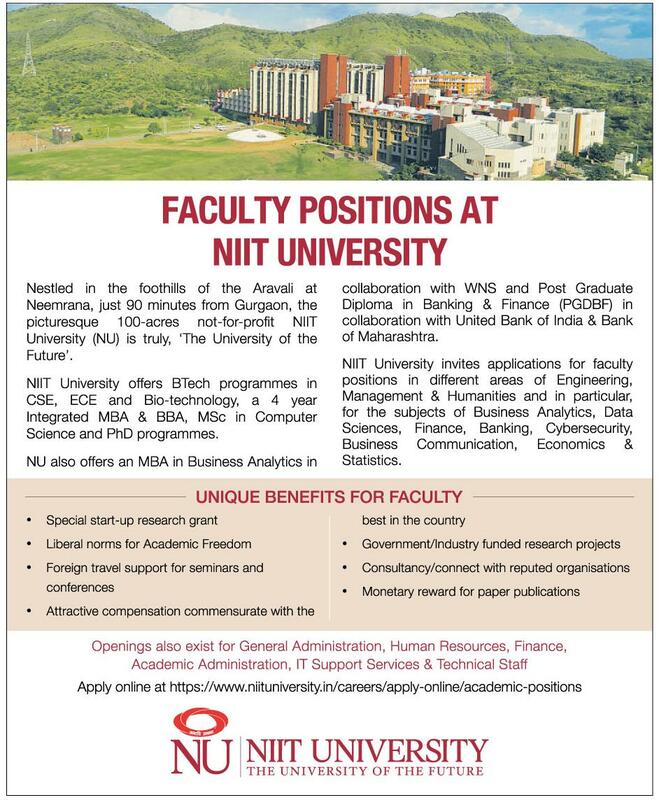 NIIT University has advertised a vacancy recruitment for faculty positions for its Neemrana campus in different areas of Engineering, Management & Humanities and particular subjects of Business Analytics, Data Sciences, Finance, Banking, Cyber security, Business Communication, Economics & Statistics etc. 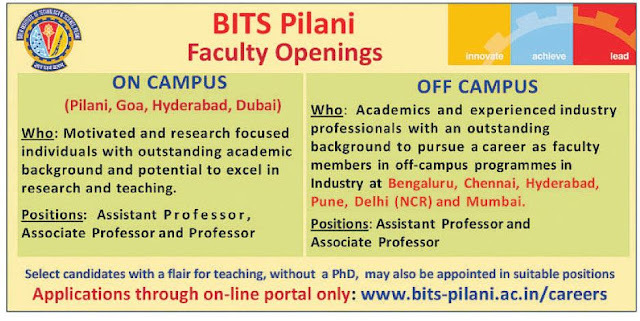 Applications may be sent electronically in PDF format to the following e-mail address: careers@niituniversity.in OR you can apply online. 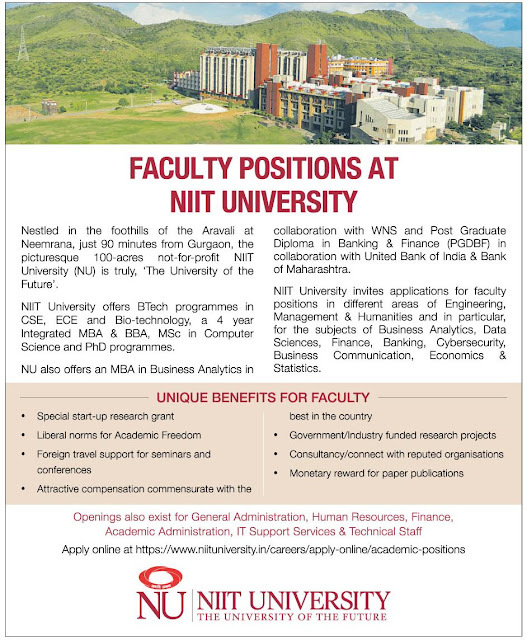 Please visit https://www.niituniversity.in/careers/current-jobs for details and apply online. 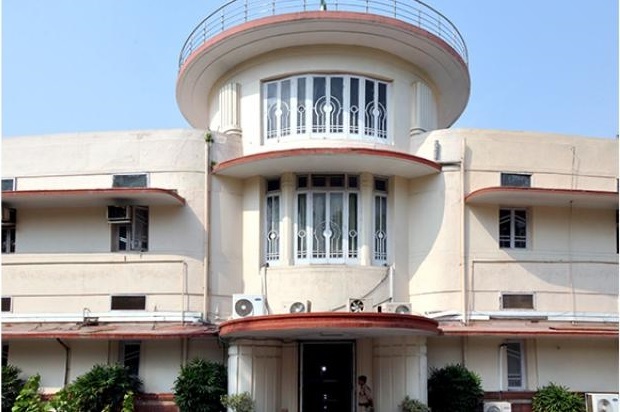 UPSC has advertised recruitment for 72 officers of Indian Information Service (IIS) in its advertisement no. 11/2017 for Vacancy of Senior Grade of Indian Information Service (IIS) Group ‘B’ (Gazetted), Ministry of Information and Broadcasting (MIB) in the prescribed online format. The pay scale is Rs. 9300-34800 Grad Pay Rs. 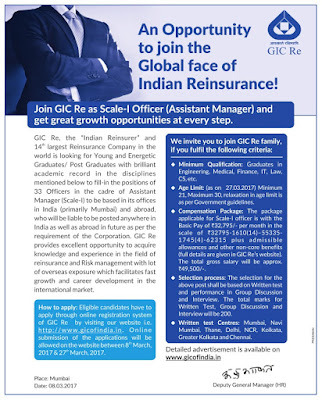 4600/- and maximum age for applying is 30 years. The last date of online submission of application is 29 June, 2017. Probationary Officers : Age : 28 years as on 31/05/2017, Qualification : Any candidate who has completed Post Graduate Degree or Double Degree holders or B.E.,B.Tech. B.Sc. Agri. under regular course from a college affiliated to a recognized University with 60% of marks and above. Candidates who are appearing for the final semester of their Post Graduation - PG from a college affiliated to a recognized University (final exam in May / June 2017) can also apply with aggregate of 60% marks and above without any standing arrears at the time of applying. Application Fee : Rs.600/- to be paid online. 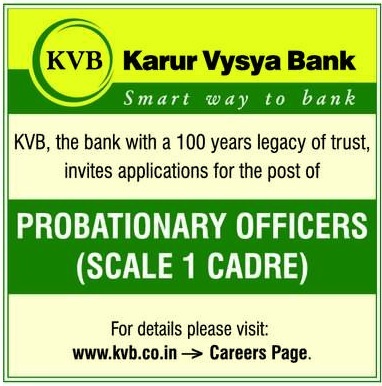 Apply Online at Karur Vysya Bank (KVB) website from 10/06/2017 to 19/06/2017 only. Please visit Career section at http://www.kvb.co.in for details and online application format. 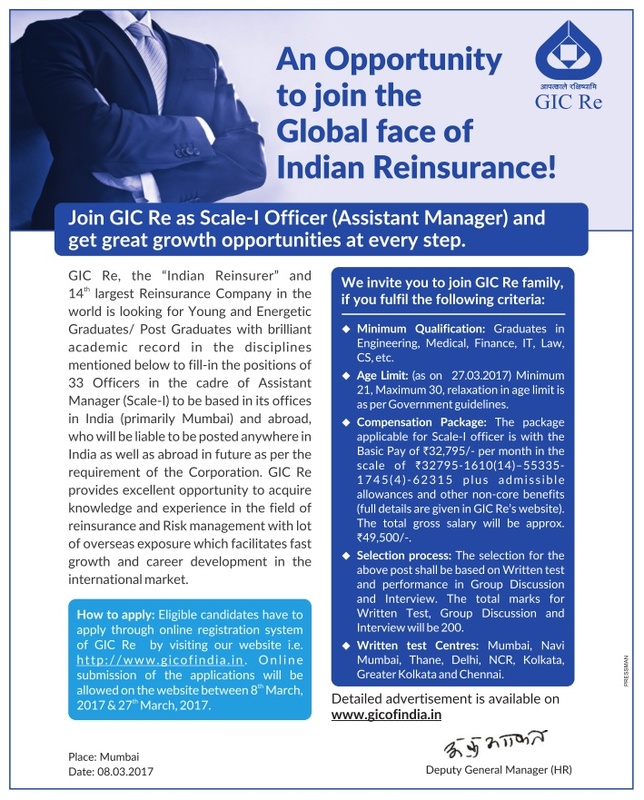 General Insurance Corporation of India (GIC) Re has invited applications for the recruitment for vacancy of 33 Assistant Manager (Specialist Officers Scale-I) posts Engineering, Medical, Finance, IT, Law and Company Secretary in various stream like . Last date is 27th March, 2017.